BOISE — The Boise State football team added a trio of student-athletes Wednesday, National Signing Day. Wide receiver DK Blaylock (of New Deal, Texas), linebacker Lolani Langi (of South Jordan, Utah) and kicker/punter Gavin Wale (of Henderson, Nevada) each signed a National Letter of Intent -- and will join the Broncos for the fall of 2019. The signings bring the Broncos’ 2019 signing class total to 1eighteen, joining the fifteen that Boise State signed during the early signing period. The class is comprised of individuals from California (seven), Texas (three), Arizona (two), Nevada (two), Utah (two), Canada (one) and Idaho (one). “Ten of the individuals play on the offensive side of the ball, including three wide receivers, two each at quarterback, running back and offensive line, and one tight end,” said BSU Associate Athletic Director Joe Nickell. 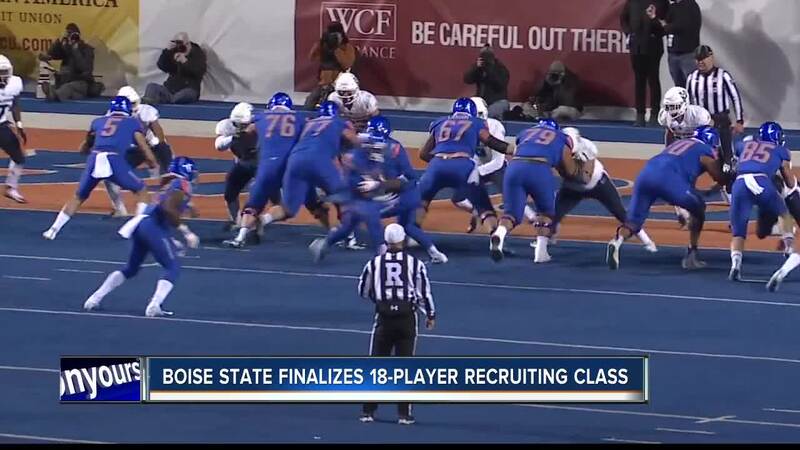 “Defensively, Boise State signed seven players, including two each at STUD and linebacker, and one at cornerback, safety and defensive line,” he added. Wale, the cousin of former Boise State punter Sean Wale, is the lone specialist in this year’s class. According to national recruiting sites, the Broncos signed five four-star prospects and twelve with three-star ratings.